In the shower, neither the Macadamia Natural Oil Shampoo nor the Renee Blanche conditioner felt very special, the scent of both are rather generic; neither of them wowed me. However, after fully drying my hair, it was so shiny and soft! I'm used to my hair looking shiny, but in a greasy way, but with these two products my hair had a natural shine. I will continue to use these two products in my daily hair routine, and hopefully my hair won't build up a resistance to the product so that they no longer do their magic. Thus I usually have to rotate shampoos because of this, but hopefully not any more. The only downside to these products is that they are on the pricey side. I have never spent more than $5 on a bottle of shampoo or conditioner before this. The products were at least nicely discounted at Winners, and I know a couple places in town that sell cheaper hair products too. I probably wouldn't pay the $20 CAD regular price for the shampoo though...that is a bit much. 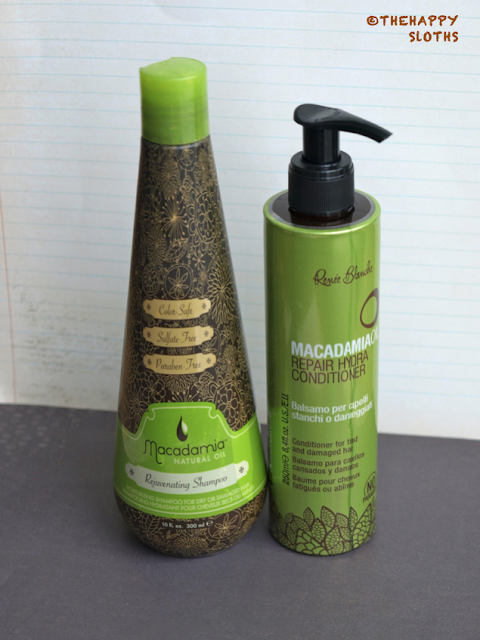 Have you tried any macadamia oil product yet? What are your thoughts?